Beatrice is a teacher in Kumbo, and a member of the Board of Directors for the Kumbo Water Authority. She is distributing the books to schools, and has created a lesson plan for them to use. "Both the teachers and pupils are so enthusiastic about our book "Clean Water for Lukong" For end of year activities the book will be acted in a play in three schools during the graduation ceremony of the children. During these occasions parents and members of the public are invited to come watch their children take part in various activities that will be carried out for the end of year and acting the book "Clean water for Lukong" is one of the activities. Is this not great Donna? I felt you should know this before the launching. You know acting is also a way of teaching the public about the importance of treated water. My regards to Pat. Tell her that the evening will be good. I wish all of you a fantastic book launch. Please i am waiting for feedback immediately after the launch. “I love children's books and "Clean Water" is delightful. But don't take my word. I took one copy to my neighbors' 'almost 3-year old' year old yesterday evening and he was quite excited. For a start, the "This Book Belongs To" GABRIEL (a brilliant touch) plus the cover picture made it irresistible to a boy who is obsessed with taps and water already. So we sat down and read it without further ado. He was fascinated, relating to Lukong (who he identified later on the back cover as the boy in the navy shirt), and then to the tap ("we hab one outside too ... but we hab a tap there" - points to kitchen tap - "and upstairs too!" - pointing upstairs - "I take a bath there"), the waterfall and all the lush growth around it, and the kettle boiling over the fire ("we do that camping"). He enjoyed every morsel of food, insisting we find out what "fufu" is. He had a commentary for every page, and by coincidence they'd just put together a map of Africa that day at preschool... so all in all it was a huge success. As I was leaving he was heading off for bed clutching he book to his tummy. " 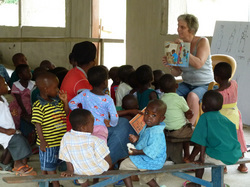 Jennifer, reading to the kids in school in Ghana. My friend Jennifer Noxon, school teacher, visual artist, and fellow singer/songwriter (solo, and Frida's Brow) went to Ghana in the winter of 2011 and took some copies of Clean Water for Lukong. "Hey Pat, What a beautiful book..the kids were mesmerized...I don't think they had ever even seen a storybook before....thank you so much for your donation - all five books found good homes. You have a real winner there. "